It's JerryTime! » Blog Archive » Computer Neck! The habit of craning your neck with non-stop work at a computer is very destructive. 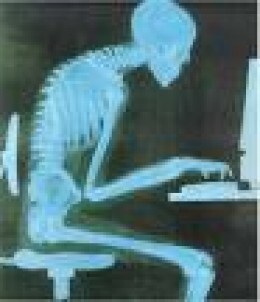 The human body is not designed to hold the same posture for more than thirty minutes. For every inch the head postures forward, it increases the weight of the head on the neck by 10 pounds. Habitual neck problems don’t stop at the computer. There’s also Reader’s Neck, Couch Neck, Driver’s Neck and Military Neck. Consequences over the years are severe, including the dreaded arthritis and hunchbackism. Female office workers are especially at risk. The first step in solving this creeping problem is to recognize it. You must actively combat Computer Neck to reverse the process. Strengthening exercises and stretching and yoga should help and there are special devices designed to address the problem. Also, here are the top ten ergonomic upgrades for your workspace. Most important of all is to adjust your habits. Correcting your posture to Ear-Shoulder-Hip-Behind Knee-Ankle is a huge step. Consult your doctor first, and do take care! This entry was posted on Monday, November 9th, 2009 at 2:48 pm	and is filed under Uncategorized. You can follow any responses to this entry through the RSS 2.0 feed. You can leave a response, or trackback from your own site.